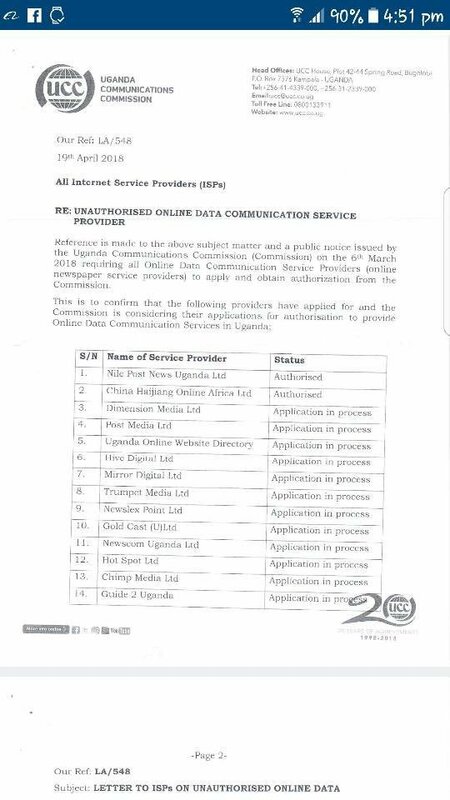 According to images shared by Albert Mucunguzi on twitter, the Government of Uganda, through it Communications Commission (UCC), has directed Internet Service Providers to block unauthorized news websites in the country. 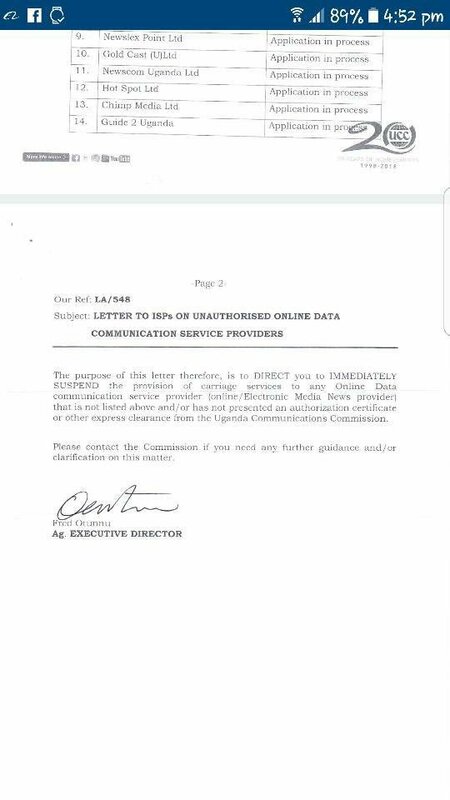 “Reference is made to the above subject matter and a public noticed issued by the Uganda Communications Commission on the 6th March 2018 requiring all Online Data Communication Service Providers (online newspaper service providers) to apply and obtain authorization from the Commission,” the letter says. The letter also adds a table of various online newspapers and whether they have been authorized or not. There are 14 media outlets listed and only 2 were authorized while the rest had an “application in process” status. “The purpose of this letter therefore is to DIRECT you to IMMEDIATELY SUSPEND the provision of carriage services to any Online Data communication service provider (online/Electronic Media News provider) that is not listed above and/or has not presented an authorization certificate or other express clearance from the Uganda Communications Commission,” the letter stipulated. As I type this, I try to consider from my own perspective as an Internet user and also as an administrator, of what benefit this might be to the Government of Uganda. At the end, the Government might ended up imposing some sort of Tax on these news sites, which on one hand should generate some revenue to the state, and which, on the other hand, can be archived without the measures above. But what if this is more of political propaganda?